7.50: We are told to line up and marched onto the train. This is always a crucial moment, when you find out who your travelling companions are going to be. As it turns out, we are sharing with a group of two women and a man, Chinese tourists from Xi’an, who frantically snap and record everything in sight from the moment they get on the train. Number six is a quiet, arty-looking man, possibly Tibetan, who chain-smokes and therefore has to stay outside in the hallway most of the time. Among the passengers further along the corridor, a stocky Tibetan monk stands out, due to his friendly, yet serious disposition. 8.30 on the dot, on the dot, the train leaves. Immediately outside Lhasa we are riding through a pleasant, rural landscape: there are yellowing fields full of haystacks and grazing animals, grey, weathered farm houses and blue, fast flowing rivers. 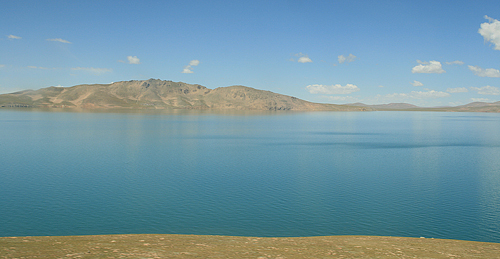 After about 40 minutes we go through a couple of tunnels and then – around 9.30 – we approach Yangbajing, famous for its hot springs and large power station and an obligatory stop on Chinese excursions to Namtso Lake. 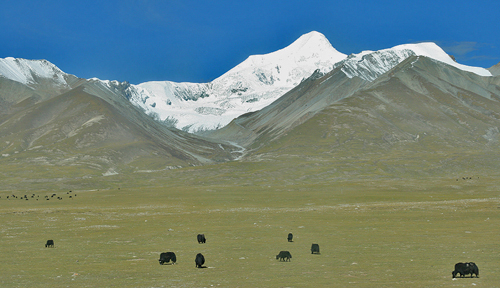 Beyond Yangbajing the landscape is like a dream: on our left there is a range of snowy mountains with vast grasslands, dotted with herds of grazing yaks, in front. On the right, the land is swampy and green, crisscrossed by frequent streams. There are many horses feeding here and small clusters of nomads’ tents. On the road that runs parallel to the railway we can see tour buses, trucks and even hand-pulled pilgrims’ carts, loaded with their meagre belongings and followed by supplicants, prostrating themselves all the way to Lhasa. Traffic and pilgrims, all look tiny in the endless, empty landscape. 10.20: The train reaches Damxhung, an ugly town set in the midst of beautiful grasslands, renowned for the variety of their wildlife and the valuable medicinal herbs that grow there. These last two facts we learn from the Intercom which keeps up a running commentary, in both Chinese and English, about all the places we are passing and, even more importantly, about the incredible achievements of the Chinese, linked to the construction of the railway. I find it, in fact, really hard to make up my mind about this project. The landscape passing by our windows is absolutely glorious and part of me can’t help but admire the Chinese for building this amazing railway and giving people the opportunity to enjoy this scenery. Yet, at the same time, I do realise that many Tibetans are bitterly opposed to the train, as it is bringing in more and more Chinese settlers.. 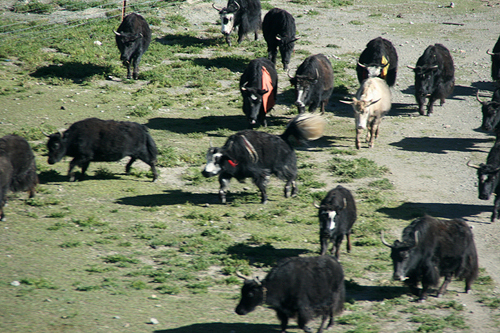 Observing the yaks, which remain highly exotic animals to me, is one of the highlights of the trip. Some of them are so hairy and have such heavy tails that, when they move, they look like elderly court ladies, swaying their hips and dragging the trains of their elaborate dresses. Others, perhaps startled by the train, rush off, all flying limbs and hair. 11.00: We are now travelling through the Gulu swamp in Nagqu county. Apparently this is partly a man-made swamp, created to replace the original swamp-land, now taken up by Nagqu station. According to the tinned comment this is a real ecological success; but who knows? 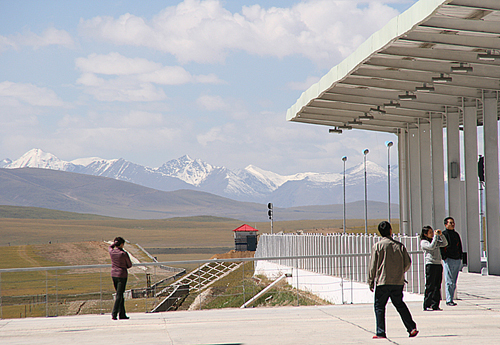 12.00: First stop at gleaming new Nagqu station, set at 4.513 metres, in the middle of nowhere. Some people with small suitcases actually get off here; God knows where they are going… My eyes follow them until they disappear into the distance, lost in this endless prairie that reminds us of Horton’s Plains in Sri Lanka: a landscape of undulating golden grasslands, not unlike a savannah, irrigated by meandering blue streams. 13.00: After a traditional train lunch of instant soup noodles we finally get a bit of visual respite: the grasslands become flatter and emptier; the mountains are lower and have lost their snowy peaks. Time for a little rest. 13.30: The peace didn’t last very long: we have to do some serious lake gazing at Cuomaer Lake, a huge turquoise expanse which is apparently the highest fresh-water lake in the world. After 14.00: We are now traversing an eerie landscape of reddish, yellow and greenish sand dunes, interspersed by turquoise rivers and with snow-capped mountains in the distance. 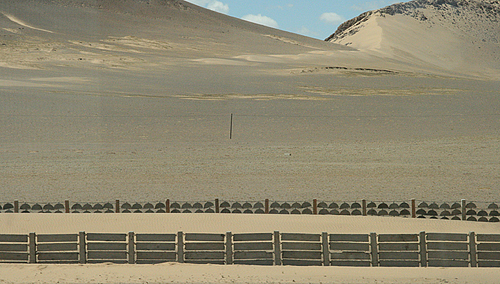 Barriers have been erected at regular intervals to keep the sand from invading the tracks. What could be a potentially desolate moonscape is saved by the play of light and shadows, conferring different shades and colours on the dunes, the azure sky, reflected in the sporadic ponds and lakes, as well as the whipped-cream of the mountain peaks. 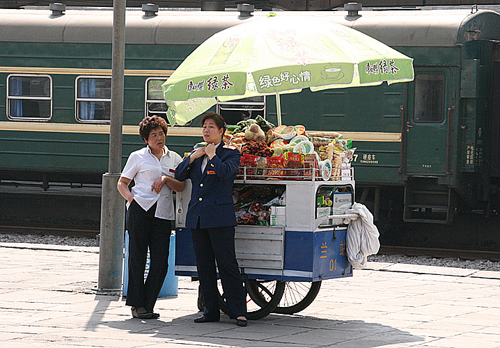 We occasionally pass a tent or shack, housing frozen-looking railway workers who wave and smile at the passing train. We can only marvel at their capacity to survive out here, and maintain their sanity! 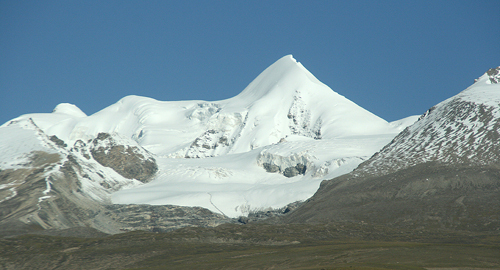 16.20: After prolonged discussions with our compartment companions and the neighbours, it’s definitely established that we are no longer in Tibet, but have crossed the border with Qinghai. Somehow we’ve missed Amdo, though it must have been quite close to Cuomaer Lake; must have been when we were having our siesta. 18.05: We have just passed through a tunnel at 5.100 metres altitude, apparently the highest in the world, built on permafrost soil. Another Chinese record! The outside world, where a beautiful late afternoon light is bathing the greenish plateau and the reddish mountains, looks much like I imagine a ‘tundra’ to look. The only thing that’s missing are the reindeer though, as we are about to find out, the Tibetan plateau has its own alternative. Our travelling companions – who haven’t stopped taking photographs or exclaiming over the scenery – suddenly get overexcited, rushing from one side of the train to the other, pointing at little dots. As it turns out, they are antelope spotting; looking out for a special type of antelope, only found around here. Apart from antelopes, this region is also famous for wild asses, but both species are proving fairly elusive for the time being. 18.30: By now we are quite blasé about antelopes and donkeys alike, as we have seen so many, either grazing peacefully, drinking from blue rivers, or running away from the train. 20.00: We have left both antelopes and asses far behind us now and the landscape has become increasingly desolate, with frequent patches of ice and snow covering the ground. The train has to cross the very high Kunlunshan pass at 4772 meters, marked by prayer flags and carved mani stones, set in a forbidding, rocky terrain. Night is finally falling and, just as we emerge from a long tunnel, we catch a last glimpse of the shiny white peaks of the Kunlun range, before the train starts its descent. For a while, we are still able to make out the black silhouettes of the mountains under a half moon; then all fades in the darkness. 20.30: Time to start preparing for bed, as the lights will go off shortly. 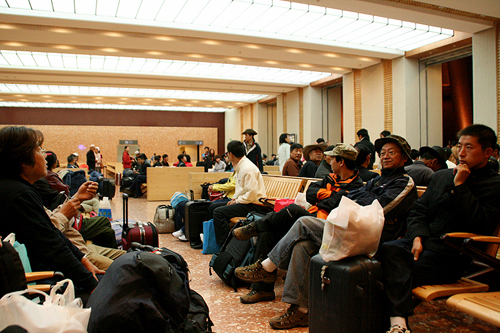 We join the queue of Chinese passengers in front of the washbasins, who are vigorously cleaning their teeth and expectorating, rubbing their faces with facecloths and slapping on creams and lotions; both women and men. We have been observing for quite a while how the majority of (middle class) Chinese men, also use cleansing and moisturising creams: this must be a pretty profitable market for the cosmetics companies. As a result, no self-respecting Westerner can really get away with being a total slob on the trains anymore; certain standards simply have to be upheld. Meanwhile, our neighbouring monk gets ready for nightfall by chanting some more prayers and waving incense sticks around. With all the excitement over the spectacular scenery and the antelopes we had almost forgotten the mystery of the vanishing sixth passenger, which was revealed during the afternoon. Our definition of ‘arty type’ was spot on, as the gentleman is, in fact, an art teacher, travelling with his students from Lhasa to Xi’an. The students are all going hard-seat, obviously to save money, and their kind-hearted teacher is lending his berth to different ones in turn, so they can have a rest for a couple of hours. This way, we see a succession of gothic-looking girls with black eyeliner, slim waifs with voluminous perms and bohemian boys in black, passing through our compartment on their way to one of the upper berths. Friday, September 21, still on the train. We went to sleep with a long-haired girl above us and woke up with a hefty boy in a military t-shirt clambering down. We have no idea how many changeovers there have been during the night, as we slept like roses, gently rocked by the movements of the train. 7.00: I’m woken up by Adam, who thinks we’re passing Qinghai lake. Unfortunately, we must have already missed it, because the lake we’re seeing is just a tiny little thing, surrounded by dry, rocky land. I’m not sad to have been woken up though, because the landscape quickly becomes beautiful again: there are fields with haystacks, covered in frost, birch and poplar trees in autumn colours and fast flowing rivers. All is bathed in a soft autumn light. I imagine that parts of Russia must look like this. 8.00: By now I’ve had my first instant coffee, mini-wash and change of clothes. We are heading towards Xining. This area is mostly Muslim; we can see many Muslim women, with their headscarves, going into the fields. Apart from agriculture, there is a lot of brick-making around here, ranging from primitive mud-kilns to proper factories with tall chimneys. I must say that I am surprised by the scenery: there is a lot more to Qinghai than just the dry, grey and dusty parts I remember from previous visits. 10.00: We have been to- and passed Xining. From the station, we picked up some fresh flat bread, Arab style, which we have with some tinned fish and hard-boiled eggs. 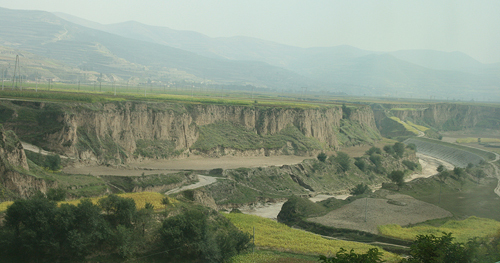 The landscape is still rural; the train is now going through a kind of gorge: tall, eroded mountains on both sides, a road clinging precariously to one side. Towards 11.00 we enter Gansu province: here is the familiar loess landscape of red-earth, rounded and eroded hills, interspersed with patches of green. In spite of its dryness, Gansu has something undeniably attractive, precisely because of the contrast between the vivid red of the crumbling mountains and the bright green of the cultivated plots. We also spy our first, brand-new Mosque, with shiny metal cupolas. 12.30: Arrival in Lanzhou. Most passengers get off to buy new supplies and stretch their legs. As a result, they also miss a hilarious Chinese pop song ,played on the train’s intercom, which starts like this: ‘wo shi Beikehamme, wo zhu zai Xibanya…‘ , in other words, ‘I’m Beckham, I live in Spain…‘. What follows is a classic piss-take of the star’s lifestyle and sporting as well as amorous achievements. After the Lanzhou stop we have a chat with ‘ma fan‘, or ‘hassle‘ man, as we have baptised our travelling companion. He is actually quite knowledgeable and gives us lots of tips about places to visit around Xi’an. Apparently, there are still plenty of sights we have missed, such as other, smaller tombs, less famous than the ‘Terracotta Army’. 14.30: We are in the midst of an amazing landscape of (almost) dry river beds, eroded to the depth of small canyons, thus creating unexpected plateaux. Every available inch, in the riverbeds, on the plateaux, on the hillsides, is cultivated in a patchwork of different shades of brown, green and yellow. The farmhouses around here are made of stamped earth or baked mud-brick and look much the same as they must have done for hundreds of years. 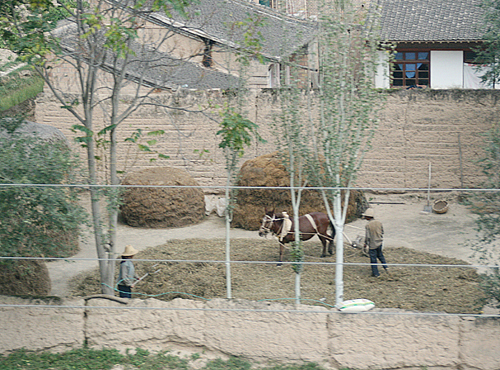 People are harvesting and threshing by hand, or with the help of mules and horses, as there isn’t enough room for machinery in these tiny terraced fields. The bone-dry hills in the distance look too barren to bear any kind of fruit and yet they too are completely covered in terraces.. I feel slightly guilty about admiring this harsh scenery, as I know the people who live around here must have a hard time, trying to eke out a living on this poor land. 15.00: We pass Wushan, departure point for The Water Curtain Cave, whose grottoes, sculptures and rock carvings, now figure high on our list of things to see in the near future. 17.00: After Tianshui, we enter an area of amazing engineering works: there are endless bridges, sandy tracks disappearing into tunnels, piles of construction materials and pieces of machinery lying around. Our train frequently has to go round long bends, so that we can see its front. Apparently, what we are witnessing here is the birth of a new motorway, linking Gansu and Shaanxi provinces. Everywhere there are long queues of trucks, cars and other vehicles, waiting to be let through on a one-way system. We cannot imagine how long some of them must have been stuck there. 18.30: The mountains are getting higher and higher and we pass a huge and beautiful blue reservoir. The sun is already setting in an intense orange ball; of course, we are so much closer to Beijing time around here. After this, we are all waiting for eight o’clock to arrive, which is when we are due to arrive in Xi’an, where our travelling companions, and most of our carriage, will get off. 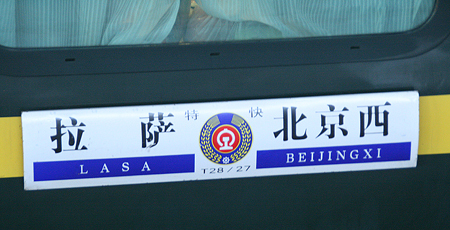 20.00: Arrival in Xi’an. Of course, new people come to occupy the empty places and the, by now, fairly grubby-looking beds. Obviously, Chinese sleepers are not such a great deal if you don’t get on where the train originates, as bedding doesn’t get changed. We have a chat with a nice lady architect, who has a daughter studying Spanish in Beijing, and a young man who does something in computers. Finally, Adam finishes off our last instant noodles in the company of the monk, who is actually from Markham – a town near Danba, in the Tibetan part of Sichuan – and is going back to Beijing for further studies. As far as spiritualism goes, he seems to be the genuine article: he has been reading religious texts, praying and chanting all the way from Lhasa. 21.00: Bed early and lights off for our last night on the train. 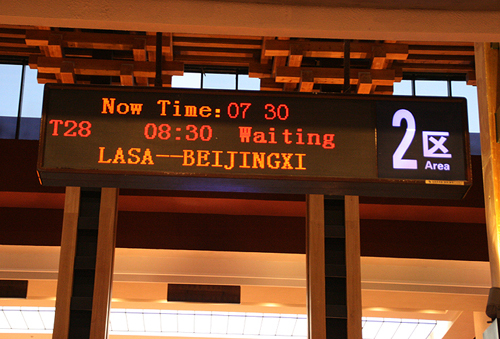 Saturday, September 22, Early Morning Arrival in Beijing. 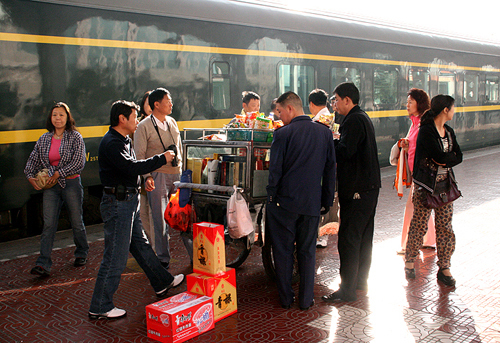 Train tickets in Lhasa are sold 10 days in advance. In September 2007 there were no agencies inside the city centre to buy tickets for you, this practice had apparently been forbidden, so the only way to obtain them is to go to the train station. 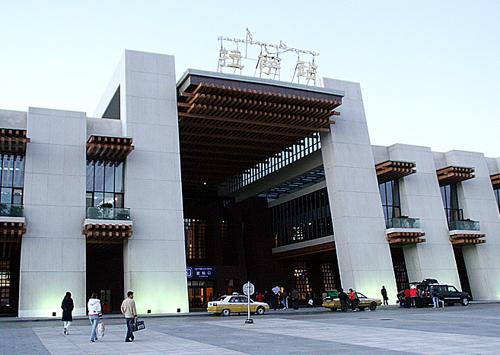 Lhasa station is about 7 km out of town and can be reached by bus and Taxi (around 25-35 Yuan). We promptly bought our tickets on day 10, as we had been told that they can be hard to come by, especially in the high season, basically July and August. Following the advice of our hotel owner we went in the early evening, around half past seven, to avoid the queues. Effectively, there were hardly any people in front of us and we had no trouble buying our hard sleeper tickets, for which we paid 813 Yuan, but soft sleepers were already sold out. The main thing is to get a train that leaves Lhasa early in the morning, to make the most of the stunning scenery all the way to the Tibet/Qinghai border. Trains have hard and soft sleepers, as well as hard seat (for real hard-core masochists or those desperate to get out). Because of the lack of oxygen at high altitudes, all passenger coaches are pressurised and extra oxygen is available to passengers through tubes should they have any problems. Each train is provided with a restaurant car and trolleys, selling basic meals, snacks and drinks, come round at regular intervals. 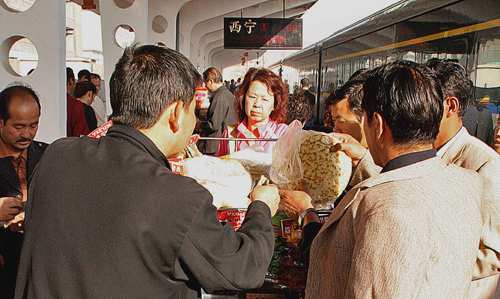 To complement the basic train fare most passengers bring their own supplies and make the most of the longer stops at stations, where local delicacies such as flat breads, boiled eggs or fresh fruit are often sold on the platforms. As on all Chinese trains, there is an abundant supply of boiled water, so remember to bring a cup or bowl if you want to make tea, coffee or instant noodles. 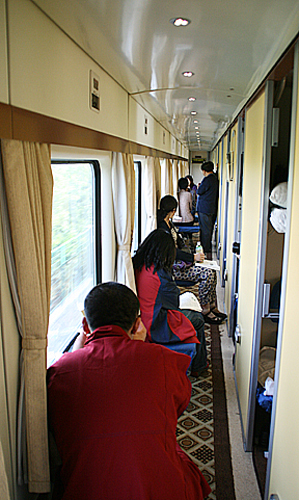 By the time you read this, a deluxe tourist train, called the Tangula Express, may have started running from Beijing, Xi’an and Shanghai, offering passengers private cabins with double beds, private bathrooms and lounge-observation cars. 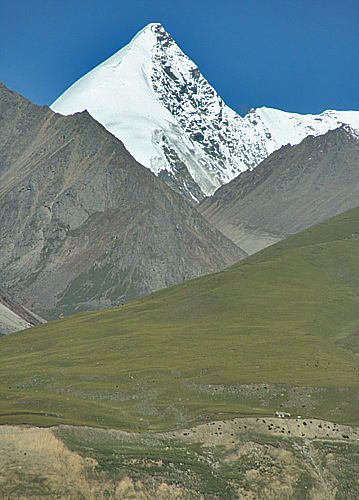 Travelling towards Lhasa, the situation is a lot trickier, as foreign travellers still need a permit to get into Tibet. From Beijing tickets were sold not 10, but only 7 days in advance. We met people who got around the permit problem by having a Chinese person buy the tickets for them. From Chengdu, we have heard that there are agents, such as www.dreams-travel.com, who can book tickets and obtain permits for individual travellers, something which is worth checking out. Very nice trip report. Thank you.